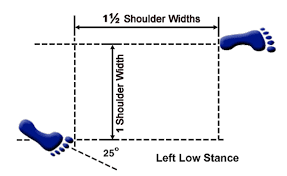 This stance is one shoulder width wide, measured between the center of the insteps of the feet. It isone and a half shoulder widths long, measured from the big toe of the rear foot to the heel of the front foot. The foot muscles of both feet tensed as if to pull the feet together.